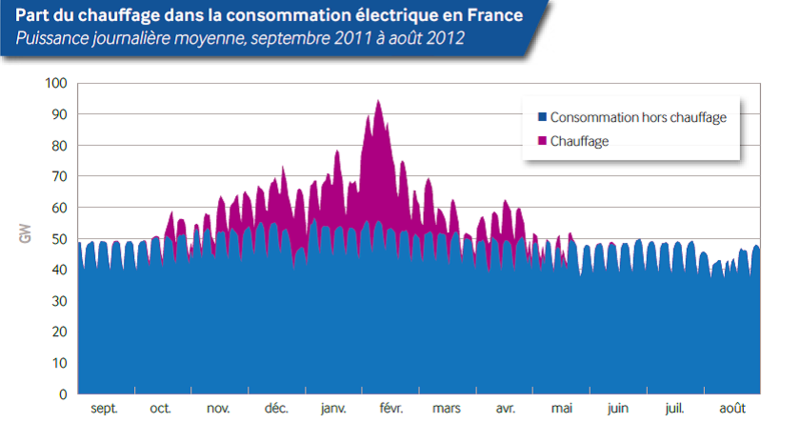 As expected, France was heavily dependent on power imports during the first cold spell of this winter. Yet, most of the country’s reactors are back online. The US is now also investigating 17 reactors with parts from France that could also be defective. Craig Morris has the details. In the fall of 2016, 20 of France’s 58 reactors were offline, largely for inspections. As of mid-January, most of these reactors were back online, however. The fleet’s total generation capacity is 63 GW, and RTE’s website shows an output level approaching 55 GW, which is near the maximum (power plants generally do not run far above 90% so they can still provide grid services, such as reactive power). EDF’s list of production by plant (zip) on January 11 seems to show that 7 reactors are still offline, which is not an especially high number (only 15 percent of the fleet). The risk is that France gets a lot of its space heat from electric units, so a cold spell poses a challenge, as we saw in 2012, when Germany helped prevent a blackout in France. Europe got its first cold spell this winter in the first week of January. During that week, France was only a net exporter of power for three brief periods, each at around 4 am, when demand in France and neighboring countries is lowest. 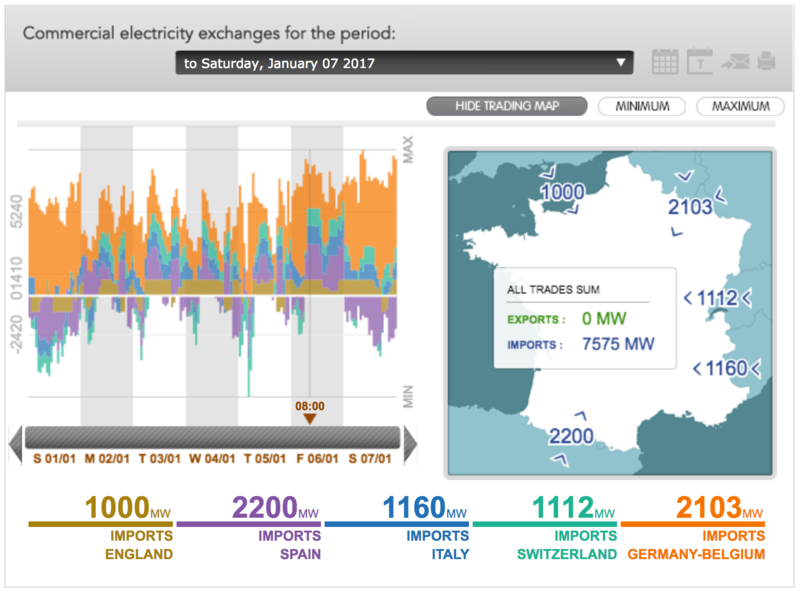 Otherwise, France was a net power importer, peaking at 8 GW (roughly 10 percent of around 8 am on Friday, January 6), as shown by the grey area at the top of the chart below. France has a total import capacity of 12,200 MW (in German) from all of its neighbors, so there is room for greater power imports, but four gigawatts is not much relative to the potential for twenty gigawatts of greater demand to reach the record level during the 2012 cold spell. 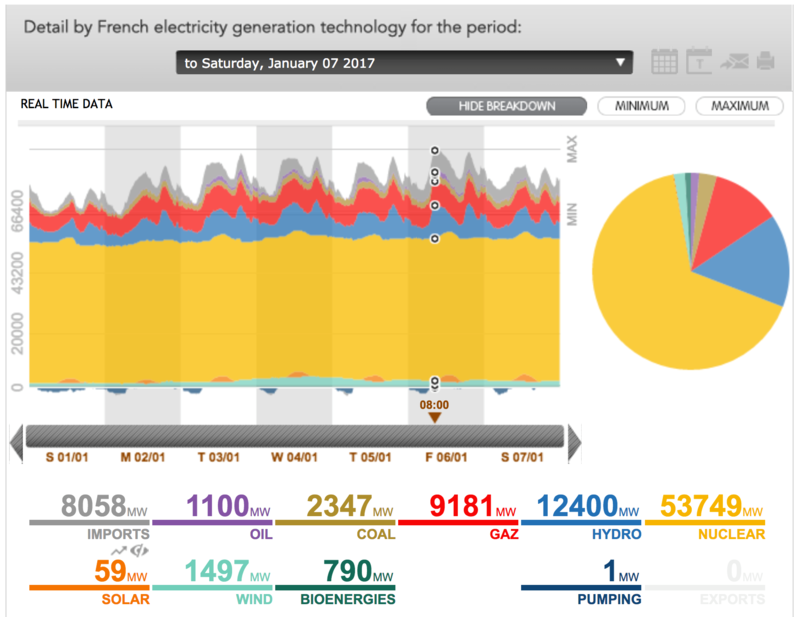 France only has 3,007 MW of coal installed, so it’s coal fleet was also running practically full blast, along with gas, listed at 10,909 MW, just above the 9,181 MW the chart indicates above. The oil-fired capacity is much greater than the 1,100 MW generated, however, at 8,645 MW – so clearly, France has lots more generation capacity, but imports are cheaper than domestic production from oil. The chart below shows the price difference between Germany and France in the first week of the year, as shown above. The gap is most striking on Wednesday for peak power, with France paying 7.2 cents and Germany 3.8 for a kilowatt-hour. The chart below shows the power trading situation for that week situation with all countries bording France. Belgium and Germany are unfortunately now lumped together (they were reported separately until last year), thereby making it impossible to say how much came from which country. But clearly, France is reliant on its neighbors during cold spells – initially, because imports are cheaper than power from oil. But the French don’t have that much reserve capacity left if the reactors cannot stay online, and the French nuclear watchdog ASN says it wants to investigate further. The US is now also reviewing the safety of 17 reactors of 99 in operation in the country with parts from Areva, the manufacturer of the defective equipment made at the Le Creusot facility. Areva is to receive a “capital injection” to the tune of 4.5 billion euros from the French state; the EU approved the deal as compliant with state aid guidelines on Tuesday. One has to keep in mind that all tested reactor pressure vessels and steam generators had only passed a theoretical test, the material itself wasn’t tested. Note that this temperature management (keeping the cooling water between 15 degrees Celsius and 30 degrees Celsius – but check the details) can’t be done by the exuiisting automatic system and must be done by hand. This means there is an inherent safety measure missing now: the reactors can’t be stopped by an automatic shut down without risking cracking, a nuclear meltdown. The automatic shutdown involves plenty of cold water being flushed through as fast as possible. If the staff fails – or the control room or the thermometer or a pump or …. the reactors can’t be handled anymore. The automatic system for shutting down in an emergency case doesn’t exist anymore resp. is not allowed top be used. This might be the reason why so many reactors are throttled down, see the Remit list linked in the first link. Not because they are increasing and decreasing the output to meet a flexible grid demand but because they are simply not allowed to run any higher. In short: the operation of these reactors is illegal since no safe automatic shut down can be done. It is not the IRSN in France which hands out permits but the ASN, the IRSN can make only recommendations. Please check the IRSN documents with the aid of a French speaking engineer, I’m not sure about the exact temperature requirements where they should be applied to. As far as I understand the IRSN the pumps and valves have to played in case of a shut down or restart like an organ by some sort of virtuoso in a boiler suit. You do your name justice again. An automatic shutdown involves nothing of that sort. The primary ciruit continues to cycle to the steam generators, the secondary side continues to be fed with the normal feedwater pumps and the steam is dumped on the condensors, bypassing the turbine. There are of course several layers of safety backup systems for cooling the primary and secondary side. Now please flush plenty of cold water through the red hot steam generators of your lovely coal plants and ruin these instruments of mass murder for good. The IRSN document concerning the Japanese reactors is about the 1450 MWe reactor class in Civeaux and not as previously stated about 1300MWe reactors. Civaux 2 is down anyhow and Civaux 1 was granted a special permit to keep it running during the cold spell. In other news, according to energy-charts.de, on Tuesday 24th January, the German 90 GW Solar and Wind generated a mere 42GWh, an average of 1.75GW, and dipping below 1 GW for hours. This is why Germany relies so heavily on Coal and Gas and will do even more so when the last 10.3 GW of reliable and clean nuclear gets shuttered to protect the goddam coal industry. France relies on nuclear precisely because nuclear is reliable, and despite long term outages and safety inspections, the 63 GW nuclear fleet churns out 56.5 GW when it is most needed. You and your fellow teutonic climate vandals want them to shut down their nuclear fleet while at the same time you point out they lack reliable generation capacity in winter. Craig, tell us, what should they install instead? Solar farms backed up by billions of Tesla power walls, or indeed Coal and Gas? The French problem is the winter heating load. The solution is not solar but wind plus pumped storage. The whole of NW France is suitable for wind, plus an ocean for offshore, and the farms can be put up in 18 months. EDF does not have to worry about NIMBY opposition. The pumped storage capacity in the Alps, Massif Central and Pyrenees would take five years at least. Meanwhile, gas backup. A big tidal flow plant can be put in the Alderney race – a one-off, but tides and currents are 100% reliable and predictable on a scale of centuries. Pumped storage does not store electricity long enough to work efficiently with wind. When the wind blows, it typically lasts several days, and they are quickly full, not able to use any of the rest of the energy, and when it doesn’t or is very low, it also lasts a few days, and they are quickly empty, not able to provide anything more. That’s why the ones in Germany, Austria and Swiss are impaired by the renewable development, not helped. Interesting data point that in the chart, peak imports to France from Spain were slightly higher than from Germany. The Pyrenean interconnector is open and allows cheap Spanish and Portuguese wind power to flow north.